Namib Desert Diamonds (Pty) Ltd – NAMDIA – wishes to address the allegations, innuendos and suggestions made by selected media claiming that NAMDIA has “deliberately sold the country’s diamonds cheaply to Dubai” and there is “continued suspicion of selling diamonds for peanuts to Middle East-based companies”. It further suggests that NAMDIA “had sold diamonds for US$500 (around N$7100) per carat” suggesting that the company has undersold diamonds.NAMDIA would wish to set the record straight on these untruths, which we hope are borne perhaps out of a lack of knowledge, rather than malice and hidden agendas. Firstly, NAMDIA wishes to state categorically that all transactions took place at the Namdeb Centre building and more recently at NAMDIA’s new office in Windhoek. NAMDIA’s buyers all travelled to Windhoek to view the goods. Secondly, in dealing with the allegations of “selling diamonds for peanuts to Middle East-based companies”, as alleged, it would be critical to understand the processes which finally culminates in the selling of rough diamonds to discerning clients worldwide. But most importantly, it is note worthy that all 17 shipments purchased thus far have been sold at prices higher than the price paid to Namibia Diamond Trading Company (NDTC). Run-of-Mine diamonds are mined at Namdeb’s operations and transported (unsorted and unclassified) to its centre in Windhoek. This is done at the Namibia Diamond Trading Company (NDTC) and as per the NDTC website, is done according to the following process. 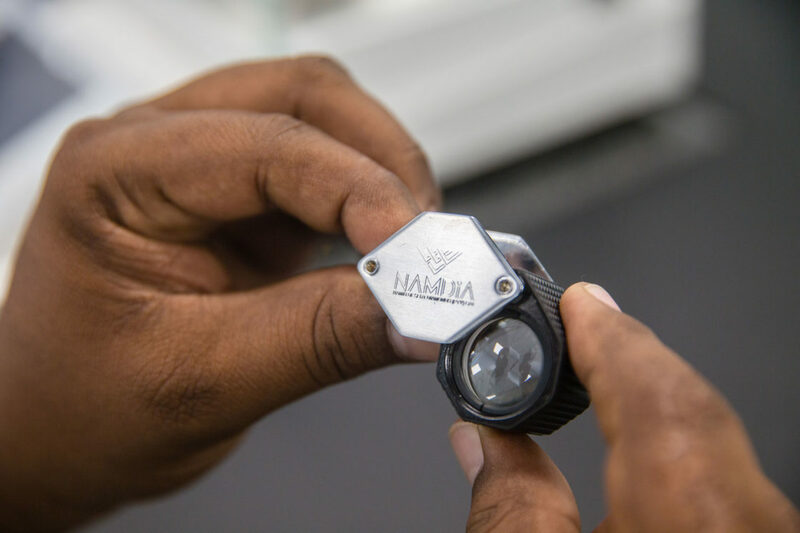 “The NDTC follows a unique diamond sorting system, which divides diamonds in approximately 12 000 price categories according to the four C’s. These categories are linked to a pricing structure that was developed by the Diamond Trading Company International (DTCi) in the UK and is used by all De Beers Group of companies with the same functions. Highly trained NDTC sorters, segregate diamonds with a minimal error rate to ensure consistency across all De Beers Group of Companies.” (Source – www.ndtc.com.na/what-we-do/). It must be noted that the above is only applicable for diamonds up to 10.8 carats, known as series goods. The price is further determined by De Beers for a certain period during the year and is rarely adjusted depending on demand/supply and other dynamics in the open market. It must be borne in mind that a diamond is not a homogenous product but a heterogenous one. Every single diamond has its own ‘fingerprint’ and therefore not a set price. This ‘fingerprint’ is dependent on the characteristics of the diamond which are determined by the ‘FOUR C’s’. The ‘FOUR C’s’ are CARAT WEIGHT (Size), CLARITY (quality), CUT (Shape of the diamond) and COLOUR. Each stone is unique in character in terms of colour, clarity, cut and carat, and therefore it is crucial that each individual stone is valued according to these criteria. Further, diamond valuation is not only based on the stones quality alone (the FOUR C’s). The prevailing market conditions also play a role in terms of demand and supply and therefore price determination. Having intimate knowledge of the factors that impact diamond prices in addition to the diamond’s quality such as market intelligence, diamond availability and pricing information is a necessity for a successful diamond trading. Diamonds above 10.8 carats (commonly known as “specials”) are valuated on an “arms-length negotiation” process between the Government Diamond Valuator (GDV) and De Beers. At the end of these negotiations, a price is agreed upon between GDV and De Beers and it is at this price that the diamonds are sold to NAMDIA. Once NAMDIA has bought the shipment as above, it sorts it into “selling mixtures” (mix of various classifications of diamonds) based on client requirements. Clients are then invited to view their parcels (In Windhoek, NOT DUBAI or elsewhere), thereafter the transaction is finalized, and the goods shipped to their destination, after payment has been made. All these clients are industry leaders who have exemplary reputations in the industry. Thorough due diligence was conducted after a rigorous and robust selection process. This process was spearheaded by the Government Task Team (GTT) – an inter-Governmental team – headed by the Permanent Secretaries of the Ministry of Mines and Energy and the Ministry of Finance, which was mandated to embark on an International roadshow to identify clients best suited to buy Namibia’s unique assortment of diamonds. During this process, 20 clients were selected, ranked and categorized of which NAMDIA currently sells to five. The number of clients sold to has increased over time as NAMDIA’s proficiency, capacity and logistics have improved gradually since inception. NAMDIA has received numerous requests from a plethora of potential clients and the Board of Directors has recently resolved to open the process up to new clients. The advert calling for such will be published in the third quarter of 2018. It is envisaged that the selection of clients will commence in the first quarter of 2019, after a thorough due diligence process – aligned to industry best practices and international compliance requirements which must ensure that clients are not involved in organized crime, money laundering, financing of terrorism and engagement in other unscrupulous financial offences and are also compliant with the Kimberley Process Certification Scheme for rough diamonds – has been conducted. The current client base has paid a premium price for NAMDIA diamonds thus far. And this has enabled NAMDIA to become selfsustaining by building up much needed cash reserves in the absence of Government guarantee and the US$ financing required to buy the rough diamonds from the NDTC. We remain optimistic that Namibia’s highest quality gem diamonds will continue to fetch optimal prices in the very discerning world markets. Apart from price checking (window on the international market), NAMDIA’s mandate is wide and profound. 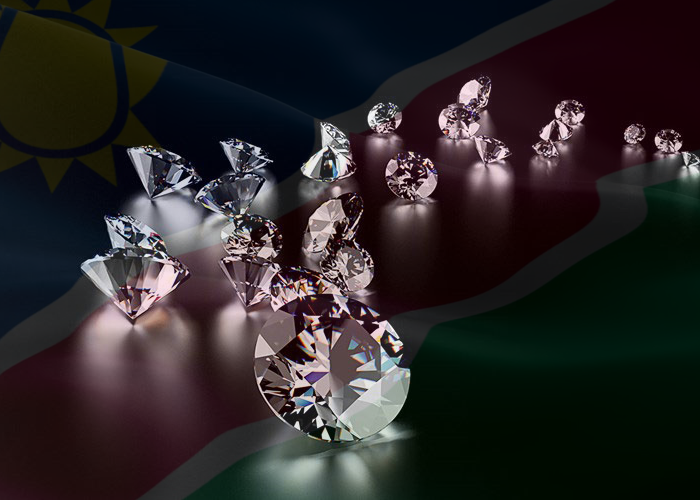 It is also the vehicle through which Namibia aims to develop a strong Namibian brand on the international diamond pipeline and leave a unique footprint of Namibia’s rare and high gem quality stones. It is also to be a trailblazer in the development of high quality jewelry for a high niche market using diamonds of Namibian provenance to create a robust and internationally recognized Namibian brand; to underline the role of Namibia as a major player in the international diamond pipeline and to leverage the linkage between diamonds and tourism; and last but not least to maximize revenue to the state and contribute our part towards the Harambee Prosperity Plan, Vision 2030 and National Development Plans. NAMDIA occupies a critical and strategic place in the economy of the country. With just 15% of the country’s diamond production, NAMDIA has been able to declare after-tax profits of over N$60 million in its initial six months of operations as per its recently published inaugural Annual Report. Additionally, it has paid over N$110 million in taxes and levies since inception. For NAMDIA’s Chief Executive Officer, Kennedy Hamutenya this is a magnificent and milestone achievement by any standards. “We have enjoyed excellent sales with good margins of profit above the De Beers selling price consistently in the past 17 sales since our establishment and we aim to continue on this upward trajectory, which I am sure will be reflected in our next annual report,” Kennedy concludes. NAMDIA trusts that the above sheds some light on our operations and finally puts to bed the unfounded allegations of impropriety on the part of NAMDIA. Finally, we invite all affected and interested parties and stakeholders to contact NAMDIA directly as we continue to remain the most authoritative source on matters pertaining to NAMDIA. We thank you for taking the time to read this lengthy piece and hope that you continue to show interest in this vibrant and progressive company which belongs to Namibia and its people.